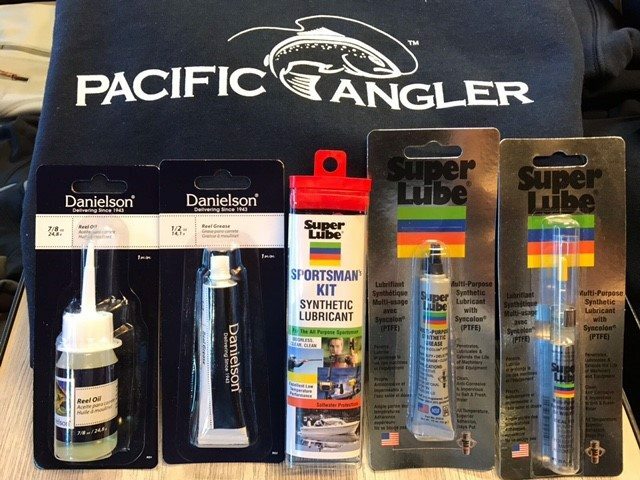 Examples of reel grease and oil we use on our reels and have in stock at Pacific Angler. If you are done for the year, make sure to spend some time taking care of your boat and gear. Take the old line off your reel and give your reels a good bath of warm water to get rid of the salt. Open up the reel, wipe away any excess moisture and let them air dry. Next apply grease and oil as needed and put the reel back together. Hold off on putting on new line for the winter. Best to wait until the springtime so it is nice and fresh. Some anglers wait until the bitter end to put on new line, trying to squeeze more than one season out of it. It just isn’t worth it in my opinion. It’s only about $25 to get your reel spooled up. This is cheap when you factor in all the other costs of saltwater salmon fishing. Remember it is the one thing connecting you to that fish, so leave the reel empty in the winter and put fresh line on in the spring before you head out. For local downrigger fishing I like 40 pound Berkley Prospec. It has great knot strength and is very thin, so the 40 feels more like the 30 of other brands. Another good choice is 30 pound Maxima Ultragreen. It is also a good idea to check out your tackle. Make sure it is dry and wipe away any rust on your spoons, flashers, and terminal tackle with some WD-40 and a cloth. Keep your tackle in a warm and dry place. When it comes to rods, give them a quick look over to make sure the guides are all in good shape and there are no issues with the reel seat. Pay particular attention to the guide insert, making sure there are no nicks, which can damage the line. If you do all of the above, when spring comes you will be ready to get back out on the water and your gear will be in great shape. If you don’t, there is a good chance your reel will be seized up and your tackle will be rusty. We see it every spring when anglers come in last minute to get out on the water. They pull their reel out of the pouch (where it was put away wet last fall) and want to get it spooled up with fresh line, but instead it is seized up! Not good. Sometimes we have to use some serious brute force to get the reels apart and often there is damage done in the process. Usually a bearing has to be replaced. If you do need parts for your reels, we can help you out. We stock the major parts and bearings for Islander, Abel, Shimano, Daiwa, Trophy, and Amundson mooching reels. The winter is a good time to get your reel fixed as we have some time to work and source parts if needed. The same can’t be said for the springtime and parts can be back ordered that time of year as well. So grab a coffee and come down to the shop with your reels and we can show them some love. When it comes to your boat, if you are keeping it in the water make sure you check on it at least every other week. If you can, keep a heater inside to keep the moisture down or use a desiccant gel pack, or both. Specific boat heaters and desiccant can be purchased at most marine stores. Inspect your bilge to make sure water isn’t accumulating and test your bilge pumps and bilge pump float switches. Check your batteries and make sure they are fully charged and if you can, put them on a charger periodically to make sure they stay that way. Each winter there are boats lost when for whatever reason they fill up with water, the bilge pump float switch goes on, the water is drained, and as this process repeats, the battery eventually dies. Next step is the boat fills up full of water, the battery is dead, the bilge pump doesn’t turn on and the boat sinks. The last thing to do is keep it clean. Don’t let the dirt, algae, and bird poop build up on your boat. It can cause damage and stains that you won’t be able to repair or get out, at least easily. This all sounds like common sense, and it is, but we all get busy in the fall and winter and next thing we know a few months have passed and we haven’t been down to the boat. The best thing to do is put it in your schedule so you don’t forget. A quick check and clean every few weeks will go a long way in keeping your boat in good shape and will maximize it’s resale value in the future. It will also give you peace of mind when you look outside, it is pouring 50+ mm of rain and you know your boat is warm, dry, and the bilge pump is working!